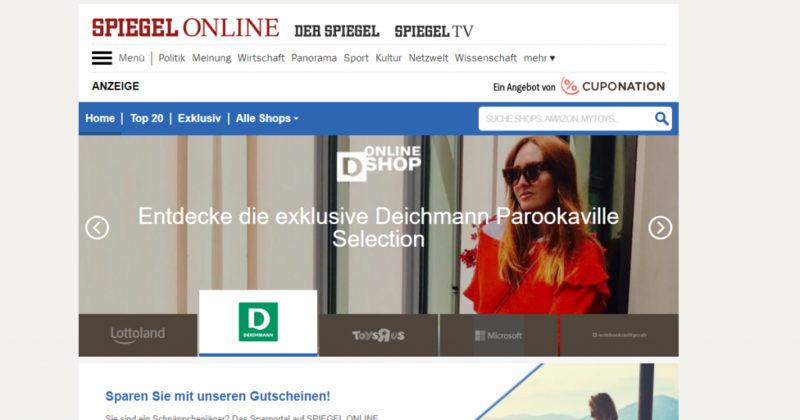 Munich, June 29, 2017 – CupoNation, a leading international provider and operator of discount code and deals portals, and SPIEGEL ONLINE, the leading German-language news website, are launching the premium discount code portal gutscheine.spiegel.de. As of now, users in Germany can take advantage of this joint offer to get discounts from a wide range of online shops and brands. With this partnership of the core brand CupoNation, Global Savings Group is further improving its position in Central Europe. Discount codes and coupons are highly popular in Germany. According to a study by Dialego AG, 86 percent of Germans find coupons useful and are most likely to use them for a specific purpose. A study by KPMG shows that around 41 percent of internet shoppers use online vouchers. One in five Germans who shop online are smart savers who search the internet for vouchers. At the same time, the importance of e-commerce in German retail is on the rise. The German Retail Association (HDE) estimates the revenues from B2C e-commerce at 48.8 billion euros for 2017, which represents growth of 11 percent from 2016. CupoNation is part of the Global Savings Group (“GSG”). The GSG has specialised in delivering commercial content such as offers, voucher codes and shopping recommendations to digital target groups. Its unique, comprehensive technical platform, which brings together advertisers, publishers and consumers, helps customers in over 20 countries to make smarter shopping decisions via more than a hundred select digital assets.